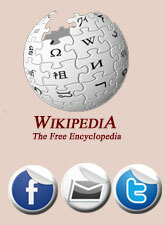 We carry both traditional and contemporary styles. 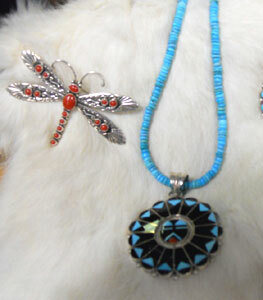 All pieces are hand worked with sterling silver, natural stone, and shell. 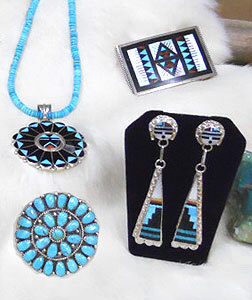 Traditional items include squash blossom necklaces, Concho belts and buckles, cluster work, needlepoint turquoise, bola ties, Santo Domingan Pueblo heishe jaclas & chokers, beadwork, fetish necklaces, Zuni inlay and more! 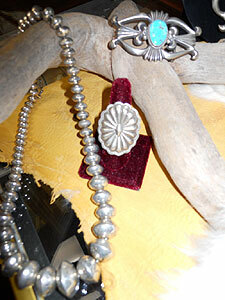 We have fine overlay silver pieces from the Hopi Mesas in Arizona. Many pieces feature old styles of sandcast, tufa cast, and repousse techniques. Please don’t hesitate to ask us to show you the difference between them as we are always happy to help with any questions you may have! 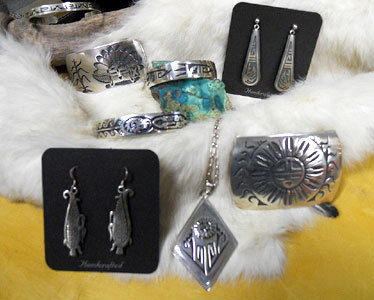 There are many Native jewelers creating beautiful modern designs today. Fine inlay with exquisite color combinations and new silver techniques make for breathtaking and stunning designs. 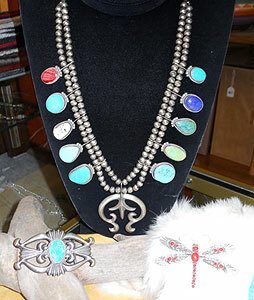 Many collectors items can be found from well known artists such as Effie Calavaza, Tommy Singer, Jonathan Nez, Joseph Coriz, Amy Quandelacy, Aaron Anderson, Philander Begay, Steven Begay, Gilbert Garcia, Alex Sanchez, Lee Charley,and Berra Tawahongva.